The holidays are a very fun time of year for the whole family, but come with hidden threats to your pets. There are some elements to holiday celebrations, like foods and decorations that can be very harmful for example, if your pet ingests dangerous foods or gets tangled in your decorations. With Easter just around the corner, now is the time to make sure you know what things could be a danger for your dog. Your dog’s body cannot absorb the plastic Easter grass that is used for a variety of decorating purposes at Easter time. The grass can get lodged in your dog’s gastrointestinal track, causing a blockage that could make your pet ill. If you notice your dog is vomiting, has diarrhea, acts lethargic, or has a noticeable decrease in appetite, it is time to see your vet. With the rebirth of spring and the prominent role that plants and flowers play in the Easter celebration, you want to make sure you keep an eye on your dog in the yard or around bouquets in the home. Certain types of lilies can be harmful to cats, in particular, as the ASPCA notes. Harmful plants like bulb flowers or lilies typically cause an upset stomach, but exposure to a large quantity can lead to more serious problems, including kidney injury. 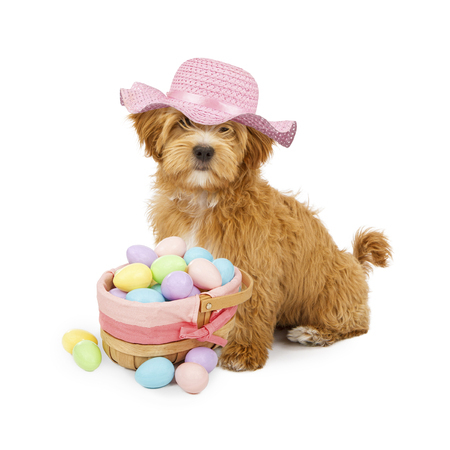 Egg hunts are a classic for the Easter holiday, but when the plastic eggs are left in the company of your dog, they can quickly be seen as a toy. It is not difficult for a dog to crack a plastic egg, which can lead to sharp or jagged pieces that your pup may unintentionally swallow. If you notice blood in your dog’s stool, moaning, vomiting, lethargy or a sense of general discomfort, seek a vet’s attention right away. This delectable treat is around all year long, but is even more common around Easter time. Chocolate is not appropriate for dogs and can lead to stomach irritation, pancreatitis, tremors, seizures and an elevated heart rate. Dark chocolate is especially dangerous because it takes a very small amount to make a dog sick. Keep an eye on your treats and keep them out of the reach of your pup. If you have yet to add a furry friend to your family, Pauley’s Pups has many breeds of dogs that would make the ideal addition to your home. Stop in and see our puppies today or call us at 804-798-7877 to learn more.